Every year, it seems that hiring and retaining the best talent gets harder. Especially in IT and IT Project Management where that talent now has infinitely more opportunities than ever before. I feel your pain. Say you’re an IT firm and you have a best in class Project Manager, time was that you’d perhaps look over your shoulder at the IT business across town in case they tried to poach her. It’s different now. Almost every business is reliant on IT so your PM could get a tempting approach from any number of diverse businesses. So how do you recruit and retain the best? The best answer to this question over and over is … cultural fit. It must more than a decade ago now since I read a fascinating report called “Consequences of Individuals’ Fit At Work”. Iowa University’s Department of Management looked into the effects of cultural fit between people and their job, their organisation, their group and their supervisor, and the conclusions were emphatic. An employee who fits culturally well within all these relationships was not only more likely to remain with their organisation but also performed better in the job. As I say, this report is over a decade old (2005 from memory, I’ll share a link at the end) yet many businesses still panic hire to fill key roles within their organisations, adopting a hire and hope approach. I understand why strategic key roles are called that for a reason … a business without someone in these positions for a protracted period of time will suffer commercial consequences. The question you have to ask is will the consequences be greater than having the wrong person in the position. Let’s say you’re an airline. What are the consequences of not having a pilot this weekend? Flight cancellations, some disgruntled passengers, perhaps a short term reputational hit … now, what are the consequences of putting the wrong person in the cockpit? I mean, Steve in sales is pretty good on the flight simulator on his X-box and he’s seen Snakes On A Plane … twice. What could go wrong? Point is, you wouldn’t be in a hurry to fill a role with a candidate with the wrong skills so why rush to hire someone who doesn’t fit your firm’s culture? The Society for Human Resource Management (SHRM) puts some numbers on this, believing that failure to retain talent due to poor cultural alignment can cost you between 50-60% of that person’s annual salary. It’s more than this though. Bad hires impact morale, productivity and your capability to offer effective client solutions – the reason you’re in business. Almost half of businesses (41%) report they’ve made at least one bad hire in the past year. Almost half! It gets worse! 95% of hirers admit they make bad hiring decisions every year and 82% of managers admit that there were clues during the interview and hiring process that should have flagged up problems ahead. When you drill down on these red flags, most of them (if not all) involve a lack of cultural alignment between the organisation and the candidate. Well, these five ideas are a start. 1 – Know your culture. Sounds obvious but it’s surprising how many blank faces meet the question, “What is your culture?”. You should have a visceral understanding of what your organisation’s culture is. If you’re struggling to identify yours getting a specialist recruiter or consultant with experience in this area can be hugely helpful. 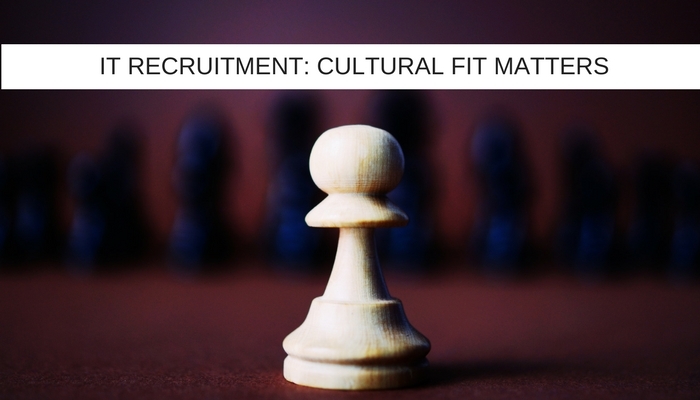 2 – When using a recruitment partner, choose one who understands the importance of and encourages cultural fit. Your partner must take time to understand your culture and what kind of person will fit and, perhaps more importantly, those that will not. 3 – Ask candidates, “What kind of culture do you best perform in?” It’s amazing how revealing this simple question can be! Does the answer they give fit your organisational culture? 4 – Get candidates to share an experience of when they felt that they weren’t a good cultural fit with the business they worked for. Again, very simple but illuminating inset into the mind of the person you’re interviewing. If they describe your culture – thank them for coming in! These are just five things that you can do. Increasingly, it’s becoming important that you do something, especially in IT roles. In most firms, IT roles are among the most strategically important. Everyone benefits when talent has a connection with your organisation that goes beyond a transactional exchange of salary and services. They perform better, they stay with you longer and nothing cements an organisational culture more than when it runs through the DNA of all its contributors. Previous A poor workman blames his tools – is this true in IT project management?